Jeff and I pulled together a last minute vol biv trip for this weekend. We don't have any big goals, just to get out in the wild for a couple days, mainly as a shake down for his trip to New Zealand next month. We are both on the west coast for work this week so the plan will be to huck off Laguna, east of San Diego and head north for a couple days. 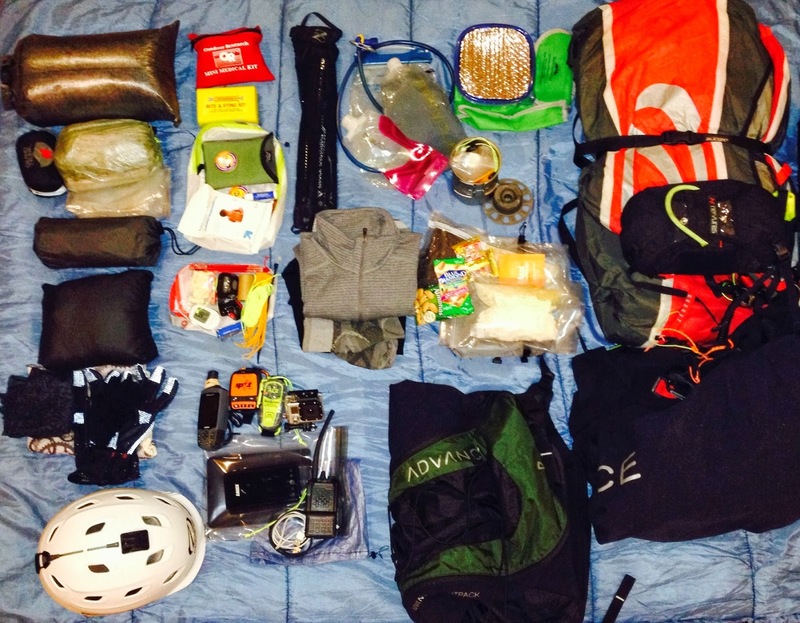 Here's my kit for the weekend - all up weight less food and water is 30.6lbs. Adding 2.5 lbs of food and 2.5 liters of water brings the total to 38.8 lbs. 3) Tarp - Zpacks Hexamid Tarp w/ cuben fibre ground sheet. 8) snake bite kit - threw this in there but the more I look at the weather (cold), I think I will leave it behind. 11) Black Diamond Z-poles - carbon fiber walking poles. 12) spare clothes - extra merino wool base layer (top & bottom), Patagonia Cap 4 sweater, spare merino socks, fluffy sleeping socks. 13) hydration kit - 2L, 1L and .5L platypus bottles. 22)Gloves & flight attire - 2 Buff's, 1 merino beanie, 1 pair merino liner gloves, 1 park Manzella goretex wind breaker over gloves. Yes, It's over kill. iPad is for checking maps and reading at night. Gopro to document the trip & radio for in air communications - we want to stay together. There is also a bit of redundancy with both the Spot and the PLB. For emergency help, nothing beats the PLB and but the Spot lets our wives track us (piece of mind) as well as allows easy coordination of a retrieve. I could likely ditch the Garmin, but I've been using it as a backup nav for flying and hiking for years and I'm comfortable with it. Rain gear - we are not expecting rain and a few spinkles or a dusting of snow won't bother us. If it looks like a downpore, the chances for flying are nil so we will scrap the trip and go ride dirt bikes. Water Filter - we will be in the high desert and will be packing in all our water The only water I expect to find would be snow and we can boil that for cooking. There should be some accumulation in the shade at the higher elevations. So where does all this fit? Well, most of it goes into the harness for both flying and hiking. The sleeping bag & clothes fit into the harness in the back protection pouch (after removing the foam back protector). The sleeping bag is in a dry sack and partially inflated so it would provide a bit of protection in the event of a crash. 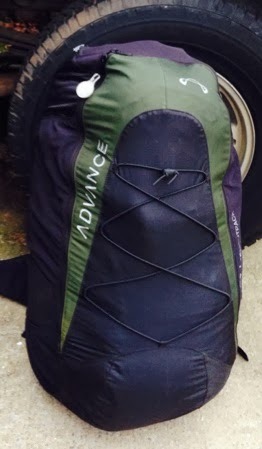 The tarp, sleeping pad, repair kit & ditty bag fit in the ballast pocket of the harness. The electronics are mounted on the harness during flight or stowed in the helmet for hiking. For hiking, the glider goes into rucksack first, with the harness, with its contents goes on top. Then I can put the cook set bag in the rucksack, wedged between the two. The first aid kit lived in small top pocket on the rucksack. Water is stowed in the side pockets of the rucksack and I put the food in a Zpacks chest pack, attached either the top or front of the rucksack.